The Edmonton Energy and Technology Park (EETP) is separated from residential neighbourhoods by Anthony Henday Drive and Manning Freeway. A number of farms and residential uses currently exist in the EETP. As development occurs, neighbouring residents will need to be considered to minimize concerns during both construction and ongoing operations. New proposed developments may require public engagement as part of the planning and development process at the City of Edmonton. The Alberta Capital Region is represented by the Edmonton Metroplitan Region Board (EMRB) and is made up of a conglomerate of municipalities that surround Alberta’s provincial Capital — Edmonton. 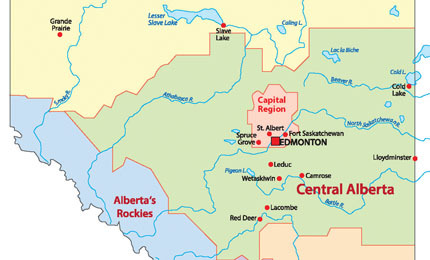 The EETP is bordered by a number of municipalities including Sturgeon County, the City of Fort Saskatchewan and Strathcona County. It is also adjacent to the CFB Edmonton air force base. Edmonton's Municipal Development Plan requires developers to work with neighbouring municipalities to ensure the compatibility of land use and future growth patterns in border areas such as the EETP. 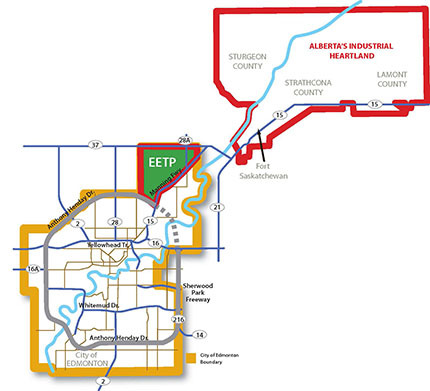 The EETP is a part of Alberta's Industrial Heartland (AIH), Canada's largest hydrocarbon and petrochemical processing region. AIH covers 582 square kilometres over five municipalities (City of Edmonton, Sturgeon County, Strathcona County, City of Fort Saskatchewan and Lamont County) and is home to 15 world-scale hydrocarbon processing facilities. Locating in AIH offers access to plentiful feedstock and established road, rail and pipeline system and salt storage caverns. The primary petrochemical industry offers excellent opportunities to expand petrochemical value chains.